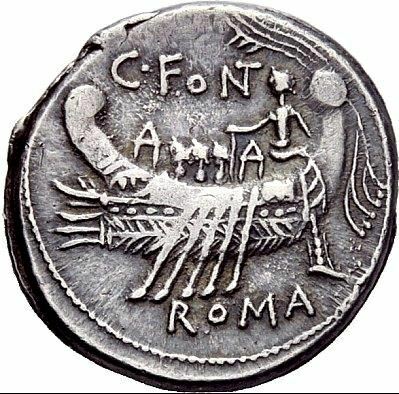 C. Fonteius was one of the moneyers for the year 114-113 BC. He or his brother served as Legatus in 91 BC. Gens Fonteia was a plebeian family at Rome. Members of this gens are first mentioned toward the end of the third century BC; Titus Fonteius was a legate of Publius Cornelius Scipio during the Second Punic War. The first of the Fonteii to obtain the consulship was Gaius Fonteius Capito, consul suffectus in 33 BC. In his oration, Pro Fonteio, Cicero mentions that the Fonteii came originally from Tusculum, of which municipium it was one of the most distinguished families. The Fonteii claimed descent from Fontus, the son of Janus. A two-faced head appears on a coin of the gens, which Vaillant and others suppose to be the head of Janus, in reference to this tradition. But as Janus is always represented in later times with a beard, Eckhel maintains that the two heads refer to the Dioscuri, who were worshipped at Tusculum with especial honours.